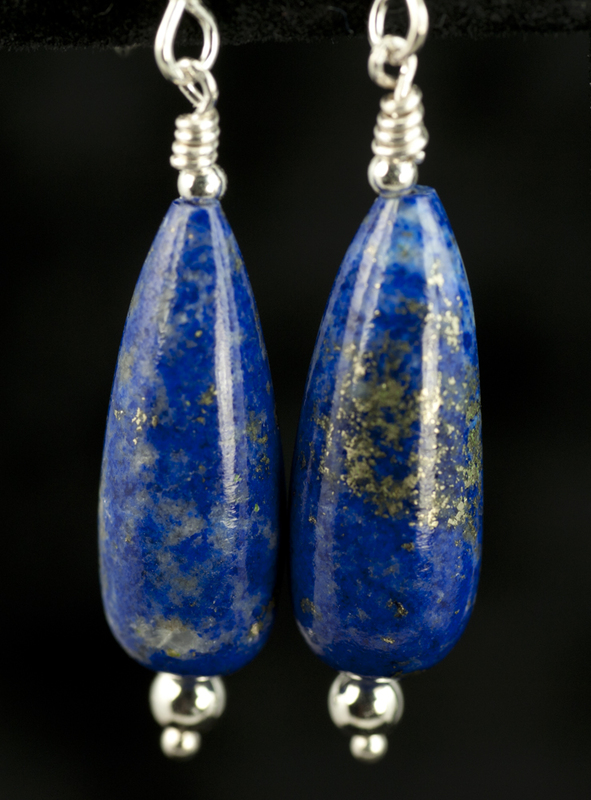 I love the beautiful blue of Lapis and I’m especially fond of lapis with a scattering of pyrite (“Fool’s gold”). 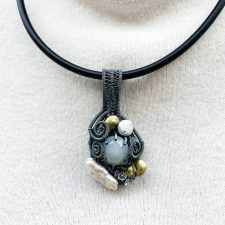 This article is illustrated with photos of necklaces that I have designed using “treasures” I have discovered in my travels – interesting silver beads and some marvelous focal pieces that I used as pendants. 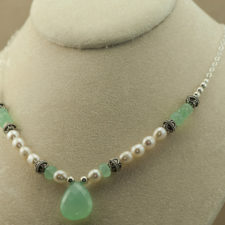 The necklace on the left has an interesting silver Afghan pendant. 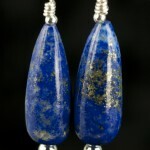 Further down there’s a pair of lapis drop earrings in a style that could go with any of the necklaces. Lapis is a stone with a long history. Ground lapis has been used as a pigment since ancient times. It was known as “ultramarine” to the ancients and the old formula for pigments is still used today by museums. With a hardness of 5-6 on the Mohs scale, depending on the impurities, Lapis is a good stone for jewelry and it has been used in jewelry since ancient times. 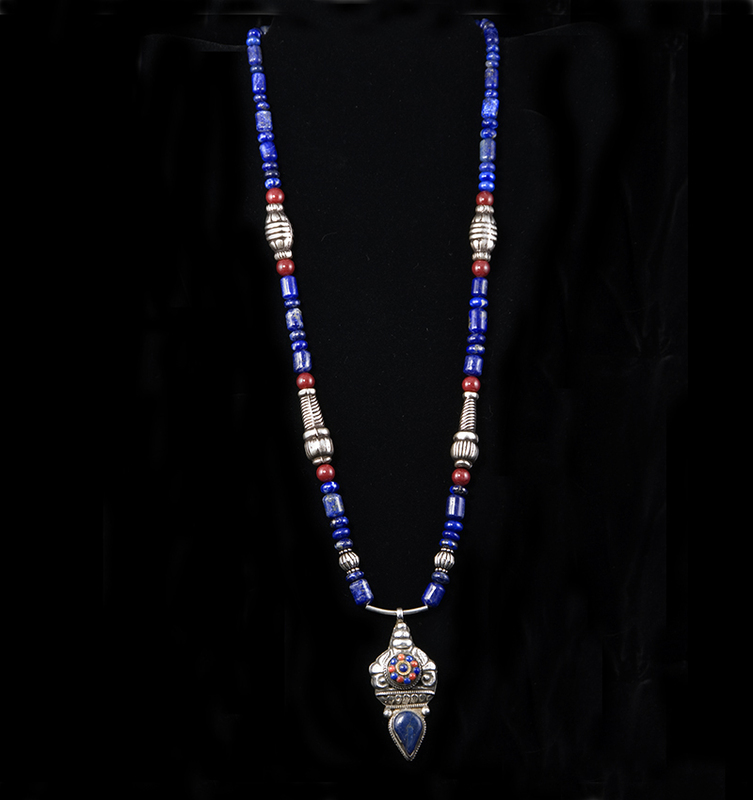 Beads and jewelry found in archeological sites trace the spread spread of lapis use from Afghanistan to the Middle East and Egypt and beyond. The Egyptians long valued this stone, not only as a source of jewelry material, but also in its ground form as a cosmetic. Lapis lazuli is a rock composed of several minerals: lazurite, hauyne. sodalite, and nosean. All of these minerals are members of the sodalite group. 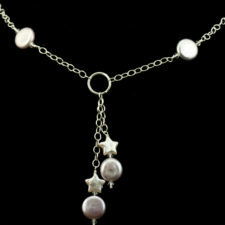 Calcite and pyrite can also be present in various percentages. The name “lapis lazuli” comes from the Persian word “lazhward” which literally means “blue stone”. The word “sapphirus” has also been used for lapis and some people have speculated that the “sapphires” of antiquity may have been lapis. Lapis is found is many places and the quality and color can vary widely. Good quality lapis of a dark color with a lot of pyrite can be found in western Colorado in limited quantities. Less desirable lapis can be found in Pakistan, Chile and elsewhere. 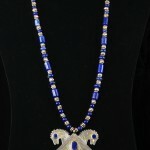 The finest lapis has traditionally come from Afghanistan. The finest lapis is considered to be a solid, deep blue with no white calcite spots and just a sprinkling of brassy yellow pyrite. Such material is found only in Afghanistan and Pakistan, in commercially interesting quantities. The Colorado material is quite fine but of limited availability. 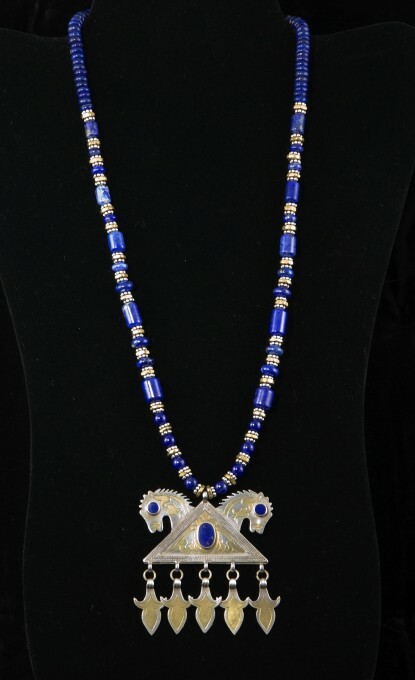 The necklace on the left was created for this interesting Turkoman double horse pendant. 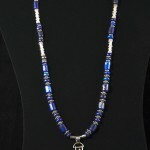 Value in lapis is determined almost exclusively by color, with deep, intense, blue with violet tones being at the apex. The quality of the finish and polish is another factor, too. Better quality material can attain a smooth highly polished surface that’s not seen in lower material grades. I really like lapis stones with a scattering of pyrite inclusions. I personally like these inclusions. I think the pyrite enhances the stone’s appearance. 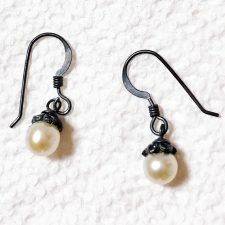 The earrings on the left below show quite a bit of pyrite. 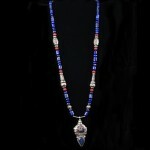 Gem Lore – Lapis has long been thought to increase awareness and objectivity. 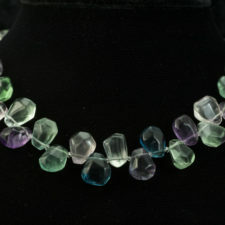 It is also considered to have healing and curative properties and to encourage creativity and serenity. Caring for Lapis – Lapis is sensitive to pressure and heat. Steam, chemical solvents, and ultrasonics should be avoided for cleaning – a soft brush and mild soap is the safest approach.